Pictured from left to right: Alex Sims, Kaitlyn Ledford, Haley Brenann, Anne Moss Rogers of Beacon Tree, Lauren Bishop, Charles Shelton, Melissa Hopely of Minding Your Mind, Emma Heinrich, and Lauren Lemelin. As we walked into the gym at Godwin High School on March 24th, our Minding Your Mind (MYM) speaker, Melissa Hopely, and I were stunned by the enthusiasm of the over 1,800 students and faculty. Since incorporating MYM into our SpeakUp programming, we have welcomed speakers to fourteen area high schools, but never felt anything quite like the energy emanating out of Godwin that day. We were invited to participate in the program by No Eagle Left Behind, a student-run organization at Godwin (the eagle is Godwin’s mascot). 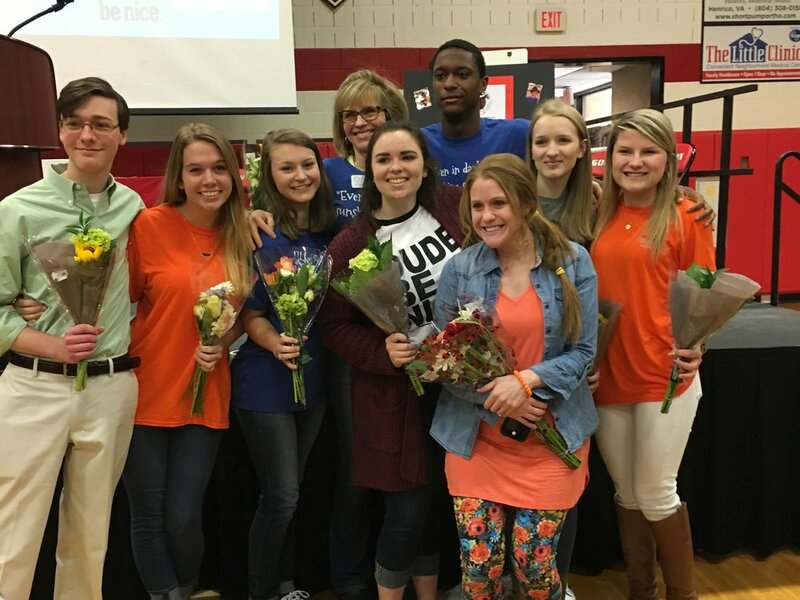 This group formed last fall to ensure that their school is a place of acceptance and inclusion. Each student member represents a specific organization: Beacon Tree, Christopher’s Angels, Dude Be Nice, and the Cameron K. Gallagher Foundation. No Eagle Left Behind members, Lauren Lemelin and Kaitlyn Ledford, knew Cameron, and have supported CKG from its inception. They both have their own stories of struggle, and were instrumental in bringing a MYM speaker and our SpeakUp workshops to Godwin. Along with creating a video detailing the No Eagle Left Behind program, this group also planned a week of awareness and education focusing on these organizations and their causes. Each day during the lunch period that week, tables of information were set up to highlight the four organizations. The week culminated on Friday with our MYM speaker, Melissa, addressing the student body. That morning at Godwin was amazing!! Students lined up thanking Melissa for sharing her story, and they, in turn, shared a few of their own struggles with her. Pictures were taken, hugs were given, and a few tears were shed. These students now realize that they are not alone, they are worth it all, and they are committed to have No Eagle Left Behind!